Who doesn't love the minions? We've been big fans since we first saw Despicable Me, so when I found out that Illumination Entertainment's Minions would be coming to Blu-Ray/DVD on December 8, I knew we'd be picking up a copy of our own. 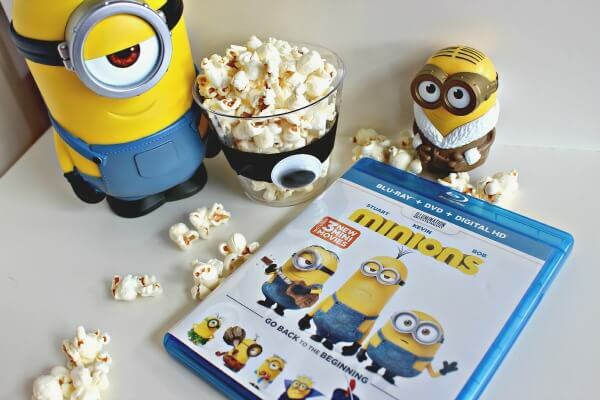 And the only thing better than watching Minions at home is making a movie night out of it! Our family likes to have pizza & a movie on Friday nights, and I couldn't wait to plan a Minions themed movie night for my boys. 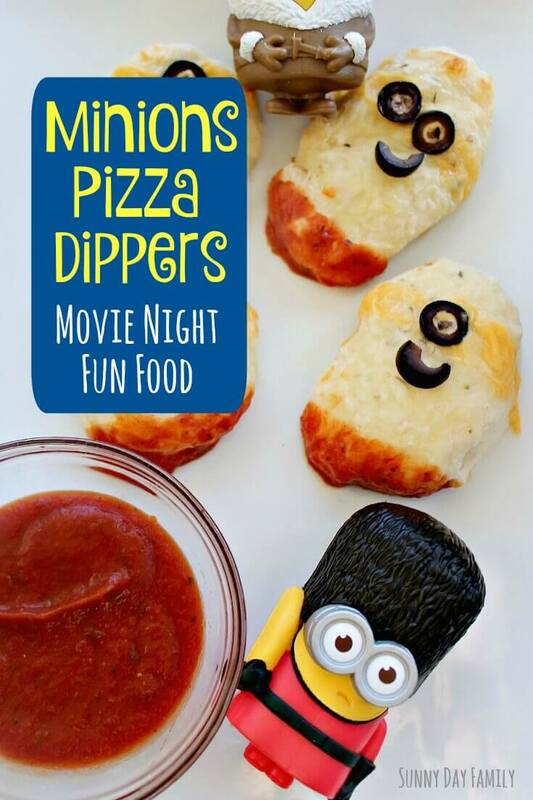 Since our movie nights usually involve pizza, I thought it would be fun to make some mini minion pizza dippers to eat while we watch Minions © 2015 Universal Studios. All rights reserved. These were easy to make and my boys LOVED them. 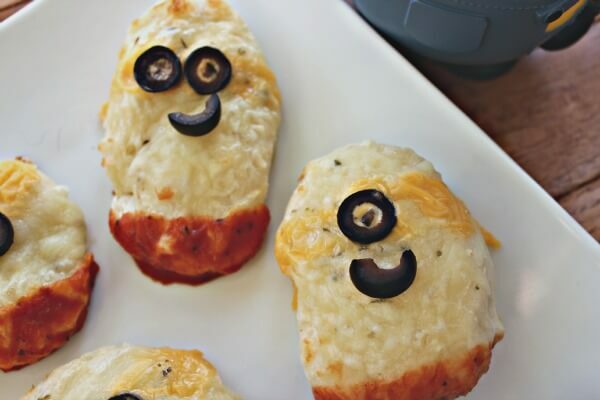 They are the perfect bite sized treat to go with the movie, and really fun to eat because you get to dip your pizza in the sauce (my kids love everything more if there's dip involved). Prepared pizza dough - use your favorite homemade recipe or refrigerated dough from the store. On a lightly floured surface, roll out your pizza dough. Use a large round cookie cutter (or the top of a drinking glass) to cut out your minion shapes. Stretch the circles slightly to create more of an oval. Brush each minion shape with melted butter. Sprinkle with Italian seasoning and garlic powder or garlic salt (use garlic powder if your butter is salted). To make goggles, add a small strip of American cheese across the top and place one or two black olive slices on top. Add a small piece of black olive to the inside of each eye. Then add a half of a black olive slice under the goggles for the mouths. Bake at 425 degrees for 12-14 minutes, or until your dough is cooked through (different doughs may require shorter or longer cooking time). Serve with a warm bowl of pizza sauce on the side for dipping. Then sit back and enjoy the show! 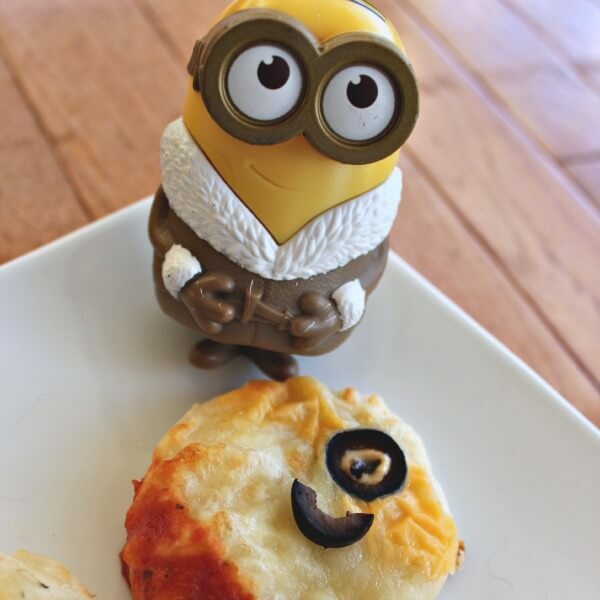 These mini minion pizza dippers are the perfect fun food for a Minions movie night! We also added some popcorn in a minion inspired cup. These are super easy to make - just wrap a strip of black tape around a plastic cup and glue a large googly eye in the center. Be sure to pick up your own copy of Minions on Blu-Ray/DVD from one of these retailers and enjoy a Minions themed movie night with your family! 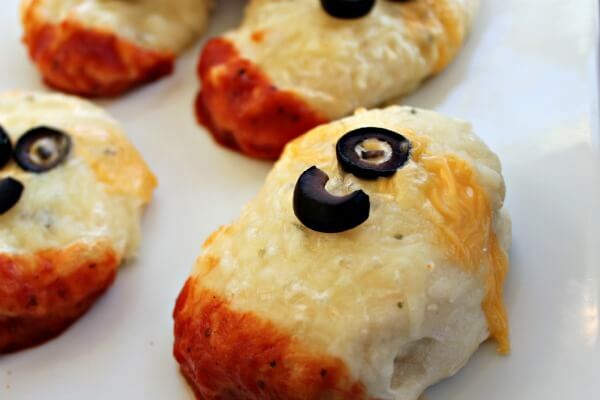 Want to see even more fun recipes inspired by the Minions movie? Find them here and let me know which one is your favorite in the comments below! Good post and images unfortunately, it lacks the heartwarming effect of Despicable Me, or more recently, Inside Out. Older kids and minion fans will probably enjoy the film, but for others, the slapstick silliness may be too much.